Chinese Dumplings are little parcels of minced meat and vegetable wrapped in a thin piece of dough. They can be round or crescent shaped, boiled, steam or fried. In northern China, they are known as jiaozi and is one of the major foods prepared for the Chinese New Year. Their shape resemble gold ingots which symbolizes wealth. The Cantonese called them gao while the Japanese named them gyoza. The latter is widely used today. 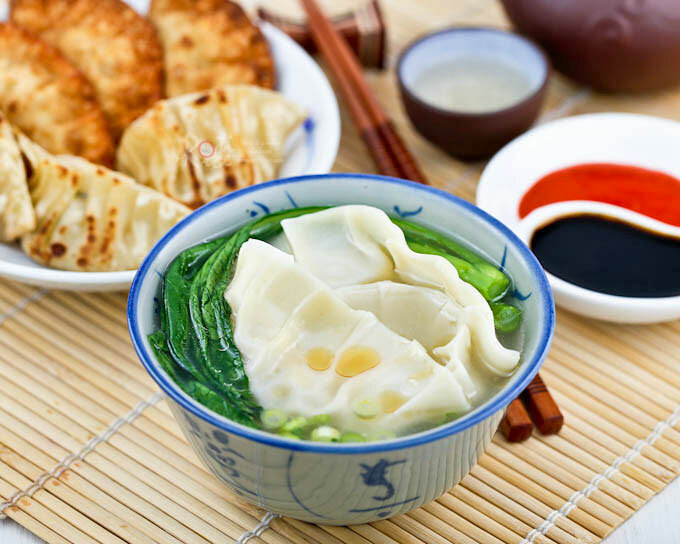 The method of preparation also distinguishes these dumplings. 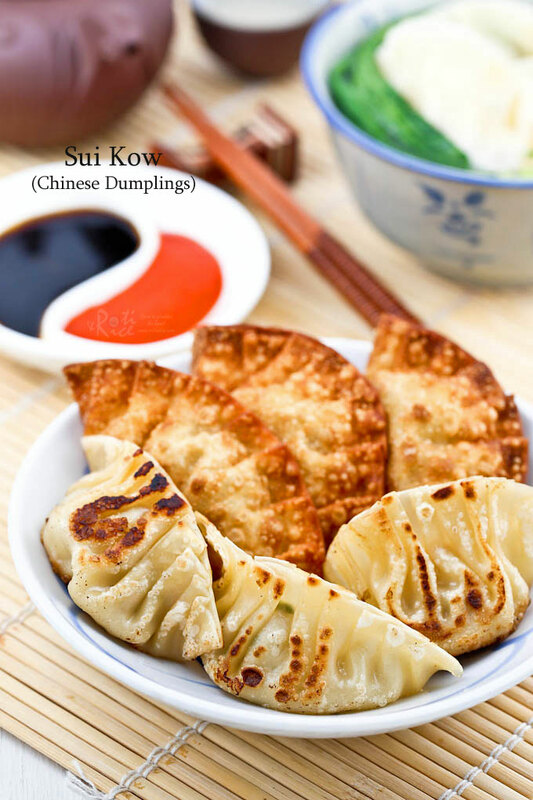 Shui Jiao or Sui Kow in Cantonese literally means water dumplings. These are boiled and served in a broth. They are shaped more like a fan. 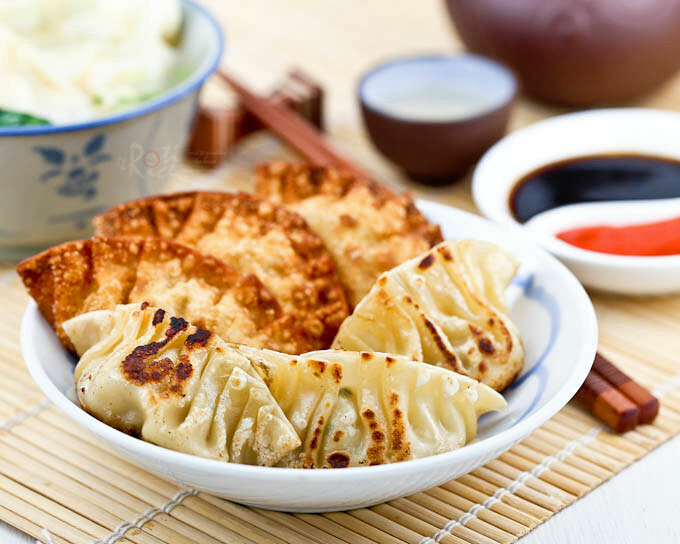 The ever popular pot stickers, guoti in North America are pan fried and then steamed. Jiaozi may be steamed or deep fried. Both guoti and jiaozi have the more traditonal crescent or ingot like shape. Mix all filling ingredients in a bowl. Allow it to marinate for 30 minutes. Place one pot sticker wrapper on palm. Spoon 1 teaspoon filling in the center of the wrapper. Moisten wrapper around the edges with a finger dipped in water. Fold wrapper into a half circle. Fold 6 to 7 pleats around the edge of the wrapper from one end to the other. Press to seal. Place dumplings in a single layer on a flat plate. Bring 8 cups (1.9 liters) of water in a pot to boil. Lightly scald choy sum. Remove, drain, and set aside. Gently drop about half the dumplings into the pot. Reduce heat to medium and allow them to simmer for about 3 minutes. Cooked dumplings will float to the top. Remove and drain dumplings. Place 1 stalk of choy sum and 3 dumplings in a bowl. Ladle some soup onto dumplings. Add some sliced green onions and a few drops of sesame oil to the soup. Serve hot with dumpling or soy sauce. Alternatively, dumplings can be deep fried in hot oil until golden brown. Another method is to pan fry and steam the dumplings. For this method, it is best to wrap dumpling in the more traditional crescent or ingot like shape. Place one pot sticker wrapper on palm. Spoon 1 teaspoon filling in the center of the wrapper. Moisten wrapper around the edges with a finger dipped in water. Fold wrapper into a half circle. Fold 5 to 6 pleats around the edge of the wrapper from the center to the edge on one side. Do the same in reverse for the other side. Press to seal and shape into crescent. Heat 1 tablespoon vegetable oil in a large non-stick fry pan. Place half the dumplings in a single layer in the pan. Brown bottom and sides. Add ½ cup (120ml) water to pan and cover with lid. Steam fried dumplings until water has evaporated. Continue to fry until bottom is crisp. Repeat with the other half of dumplings. Remove and serve immediately with dumpling sauce. Deep fried Sui Kow (Chinese Dumpling) is delicious dipped in sweet chili sauce. NOTE: This post was updated on September 3rd, 2014 with new pictures. Another terrific recipe, and as usual, beautiful pictures. I love the history behind this dish. ooh – looks like i will be making some dumplings in the near future. i can be creative with the filling, and i like how i can eat it soft in soup, or crunchy by browning it in a pan. personally, i love snacking on dumplings with some chili soy sauce. 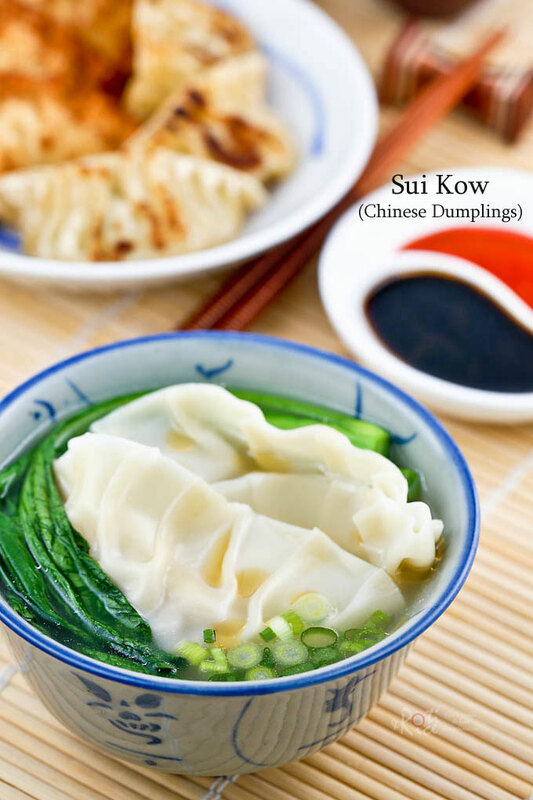 I love "sui kow" especially with egg noodle. Everything you need to know about dumplings is right here in this post! Nice photos–I love the shot of the uncooked dumplings all fanned out. Biren, the dumplings look very nice. You have just given me a tip on how to pleat it to make it look even nicer for presentation. Just the very thing I would like for lunch on a cold, windy and overcast day to cheer me up – do you do delivery? Table Talk – There are so many names for these delightful dumplings that it can be confusing. I like that shot too! krissy@the food addicts – They are nice and soft in the soup and it is terrific with chili soy sauce. Thanks for visiting and hope you return often. Anncoo – Sui kow with noodles are delicious! I like the pleats on your dumplings. I usually make wontons. tigerfish – Thanks! Wontons are good too.